This picture is a few years old, but she hasn't changed much. In the charity of your prayers, might I ask you to remember my grandmother - a.k.a., Granny - who fell again yesterday morning? Though she did not break any of her bones, she will be unable to return to her assisted living residence and will have to move into a nursing home because her strength has been fading over the past several months. Sometimes I wonder if my independent streak doesn't come from her. I don't expect she'll like this very much. Thanks be to God, though, she has made wise choices in the past. As one example, she willingly gave up her car some years back when she could still safely drive because she didn't want to get to the point where it would have to be taken from her. She's a strong woman who has been through much in her more than ninety years of life, but not foolhardy. The Lord has again blessed her and us with a similar decision. Word from home is that "she agreed that it was time" to go to a nursing home, though the decision was "not cheerfully" made. I would like to visit her this evening, but I've been advised by my family to stay in Springfield and not drive through the continuing storms (at this rate, I'm not sure they'll ever end) on the way to Quincy and back. Tomorrow I will spend much of the day teaching the Totus Tuus team. Depending on how she's doing in the morning, I may try to collapse the teaching schedule to make it home; otherwise, I'm planning to visit her late Sunday afternoon. Today being Friday, our Bishops are again calling upon us to join them in the Call to Prayer: Pledge to Fast as we pray together for the protection of Life, Marriage, and Religious Liberty in the United States of America. For engaged couples, that their time of preparation for marriage may be richly blessed as they prepare to give themselves fully and irrevocably to each other as a sign of Christ's love for His Church. If you're looking for a way to join in the Call to Prayer, the Bishops' have provided a few suggestions for us. The Pope Emeritus once described his books as his "friends," and I have often felt the same about my books. Along this same line, Andrew Carnegie once said, "The man who enters a library is in the best society this world affords; the good and the great welcome him, surround him, and humbly ask to be allowed to become his servants." I have spent the better part of the last few days packing up most of these friends, to which there has been a simple process. First, I take a book off of the shelf and look to see if I have previously added it to my collection at Library Thing. If I haven't, then I do so. Second, I place a book plate with my coat of arms and my name on the inside front cover. Third, I place the book in a tub with other books. Fourth, once the tub is sufficiently filled, I label the top and the two of the sides with a description of it's contents - for example, "Books: Arthuriana" (which incidentally cannot all fit into one tub) - so that in three years' time unpacking and reshelving them will be easier. The process has been rather time-consuming and at times tedious, but it has also been filled with many blessings. As I sifted through my collection (numbering more than 1,250 books), I remembered where I was when I read many of the books, I recalled what I learned from them, and I longed to be able to sit down and read them again, but there isn't time for that. What is more, as I was looked through the books, I was reminded of friends who recommended certain books to me. I remembered friends was were me when I bought a particular book. I remembered friends who gave certain books to me. I wondered about the previous owners of some of the books whose names were written in them. As the memories entered my heart and mind, many prayers of gratitude were raised before the throne of grace. books in my suite. I'm guessing that at least six tubs will be needed to pack the books in my office. Throughout this process I have been greatly surprised at my own discipline. As I handled each book I asked one question: "Will this book come with me to Rome, or will it stay behind?" One book missing in the above picture is one containing the Legends of King Arthur; I haven't decided which one to bring. This seems to me a very good whittling down of my books, but I haven't yet gone through my collection of Ratzinger/Benedict books. and a faithful steward of your mysteries. I have remarked here on occasion of my love of the legends of King Arthur and the Knights of the Round Table that I first discovered as a young boy. Still today I take delight in these stories and am always eager for more, particularly as regards the quest to discover the man who lay at the foundation of the legends. When some weeks back I first learned of the coming release of an alliterative verse poem by J.R.R. Tolkien titled The Fall of the Arthur, excitement grew in my heart because I knew the brilliance of his version of Sir Gawain and the Green Knight. Tolkien was a master at taking ancient metrical patterns and making modern English fit to them. His The Fall of Arthur is sadly incomplete, despite the urging of R. W. Chambers who, on reading the incomplete poem wrote to Tolkien, urging him, "You simply must finish it." How I wish he had finished it! The poem itself consists of but five cantos and covers the betrayal of Mordred, Lancelot and Guinevere, and the circumstances that would lead to the terrible Battle of Camlann, though The Fall of Arthur ends rather abruptly, too abruptly and at a moment where it lifts the heart ever more into its tale. It seems to me that the poem is best read aloud, but even when read quietly one cannot help but feel as though he were in the presence of a great hall, sitting round a fire with a mug of ale, enraptured at the tale of wandering minstrel telling of the glorious and tragic days of the King whom Tolkien calls the "lord of legions, light in darkness (I.106-110). Over the last several days a discussion has begun on the list serve Arthurnet about what it is that still brings such great passion to the Arthurian legends. The Fall of Arthur continues in this great tradition and presents us with a thoroughly Christian Arthur who carries as his emblem "a white lady in holy arms / a babe bearing born of maiden" (IV.127-128). But, as in other tales, Arthur is not simply a Christian monarch, but a representation of Christ, another Christ, if you will, a true Christian, who is "a king of peace kingdom wielding / in a holy realm besides Heaven's gateway" (V.10-11). When King Arthur returns to confront Mordred and set right his treachery, "he would pass in peace pardon granting / the hurt healing and the whole guiding, / to Britain the blessed bliss recalling" (V.44-45). Here I cannot help but recall Aragorn, in whose hands are healing. What is more, Tolkien speaks of those who "their king betraying, Christ forsaking" (V.16). It is, I think, this hope of a kingdom restored, of mercy given and justice done, that elicits such passion even these many centuries later, centered on the person of Arthur who is betrayed by those dearest to him but who does not betray them in return. to awake the weary, while the world lasted (III.218-220). Are not we weary who awaken each day to look for the coming of hope, for the coming of Christ? 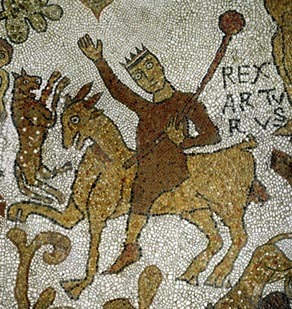 I have yet to find an adequate explanation for the curious placing of this mosaic, though I do have my own thoughts (that Arthur is here depicted as a Christ-figure), which I first began to put down on paper when I was in the seminary. It is a topic to which I shall have to return when I am soon in Italy, after visiting this Cathedral and seeing the mosaic with my own eyes. And while I'm at it, I must also see St. Galgano's sword in the stone. Following the recent appointment of Father José Rodríguez Carballo, then Minister General of the Order of Friars Minor, as Secretary of the Congregation for Institutes of Religious Life, the Presidents and Vice Presidents of the various language groups within the Order met today in Rome to elect a new Minister General. 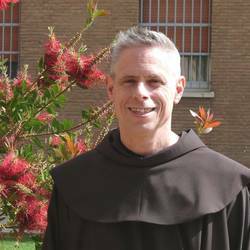 The sons of Saint Francis of Assisi have elected the Vicar General of the Order, Father Michael Perry, a native of Indianapolis and a member of the Sacred Heart Province out of St. Louis, Missouri. I am happy to count many of these friars as my friends - in fact, the Bishop and I just recently stayed with four of them in Quincy - and I warmly congratulate them and promise my prayers for them and especially for Father Michael as he assumes his new responsibilities. Catholic World News today reports on a joint initiative of the Ecumenical Patriarchate of Constantinople and the Council of the Bishops' Conferences of Europe to mark the 1,700th anniversary of the famed Edictum Mediolanense, the Edict of Milan of the Emperor Constantine I, in Istanbul this May 17-18. This news caught me quite off guard; somehow the anniversary of this document that truly changed the world escaped my notice. The issuance of the Edict of Milan is one of those moments in history of which everyone should be aware, so great were its consequences. The Edict itself was drawn up in Milan by the Emperors Constantine I (of the West) and Licinius (of the East) in February of 313 and proclaimed in June 313 at Nicomedia. Following its formal announcement, the Edict was sent throughout the Roman Empire and its shock waves and ripple effects continue to our own day, even if these waters of change are beginning to be recede and, in some instances, being dammed up. 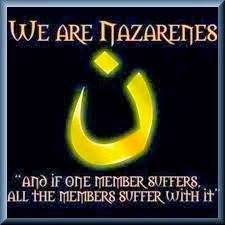 Therefore, your Worship should know that it has pleased us to remove all conditions whatsoever, which were in the rescripts formerly given to you officially, concerning the Christians and now any one of these who wishes to observe Christian religion may do so freely and openly, without molestation. We thought it fit to commend these things most fully to your care that you may know that we have given to those Christians free and unrestricted opportunity of religious worship. When you see that this has been granted to them by us, your Worship will know that we have also conceded to other religions the right of open and free observance of their worship for the sake of the peace of our times, that each one may have the free opportunity to worship as he pleases ; this regulation is made we that we may not seem to detract from any dignity or any religion. Moreover, in the case of the Christians especially we esteemed it best to order that if it happems anyone heretofore has bought from our treasury from anyone whatsoever, those places where they were previously accustomed to assemble, concerning which a certain decree had been made and a letter sent to you officially, the same shall be restored to the Christians without payment or any claim of recompense and without any kind of fraud or deception, Those, moreover, who have obtained the same by gift, are likewise to return them at once to the Christians. Besides, both those who have purchased and those who have secured them by gift, are to appeal to the vicar if they seek any recompense from our bounty, that they may be cared for through our clemency,. All this property ought to be delivered at once to the community of the Christians through your intercession, and without delay. And since these Christians are known to have possessed not only those places in which they were accustomed to assemble, but also other property, namely the churches, belonging to them as a corporation and not as individuals, all these things which we have included under the above law, you will order to be restored, without any hesitation or controversy at all, to these Christians, that is to say to the corporations and their conventicles: providing, of course, that the above arrangements be followed so that those who return the same without payment, as we have said, may hope for an indemnity from our bounty. In all these circumstances you ought to tender your most efficacious intervention to the community of the Christians, that our command may be carried into effect as quickly as possible, whereby, moreover, through our clemency, public order may be secured [more]. In short, the Edict of Milan not only made Christianity a legal religion within the Roman Empire, but also restored to the Christians those properties which had been confiscated from them (why Constantine generally receives the credit for the edict and Licinius does not, I do not know). You will often find textbooks that claim Constantine I made Christianity the official religion of the Empire; this is simply false. Constantine I did not make Christianity the official religion of the Empire, but made it a legal religion in the Empire; a Christian could no longer be persecuted legally because of his faith in Jesus Christ. It was the Emperor Theodosius I (r. 379-395) who, on 27 February 380, with his Edict of Thessalonica, made Christianity the "official" religion of the Roman Empire when he decreed that the citizens of the Empire "should continue to the profession of that religion which was delivered to the Romans by the divine Apostle Peter, as it has been preserved by faithful tradition and which is now professed by the Pontiff Damasus [r. 366-384]." What is more, Theodosius I declared in the same document that those who did not profess the faith of the Apostle Peter "shall be branded with the ignominious name of heretics, and shall not presume to give their conventicles [meetings or assemblies] the name of churches." How so many textbooks - written by those who claim to be historians - could confuse and conflate two key historical events separated by 67 years is beyond me. It is curious how 1,700 years after a decree was issued that granted religious freedom to Christians that same freedom is now slowly - though increasingly - being stripped away from Christians. I know I am a little late with this post, but I've been pondering it for a few days. Father Damien is generally not very far from my thoughts, not least of all on his feast day, and I frequently find myself calling upon his intercession. Father Damien arrived at the Kalawao leper settlement on the Kalaupapa peninsula of the island of Molokai 140 years ago this past Friday, where he spent the remaining 16 years of life. He arrived in Hawaii 9 years earlier after a 5-month voyage at sea from his beloved home and family. As you read through the letters he wrote to his family back in Belgium, you soon become aware of how isolated from them he felt. Naturally, in those days communication was not as swift as it is in our day of telephones, airplanes, e-mail, Facebook, Skype, and Face Time. Not only did you have to wait for the length of the voyage for a letter to reach the one to whom you wrote, but you first had to find a carrier heading at least in the general direction of where your letter needed to go. You can imagine how this was not always timely, particularly if someone moved after you sent the letter. Three years now, and not a line from you. Where are you then, my dear sister? Are you off to Heaven already? Not so fast, if you please. A little more time is needed to win that crown. Take pity then on your poor brother, who, by dint of being so long forgotten, will soon become a regular savage among savages. Well, I certainly love my savages, who soon will be more civilized than Europeans. They are learning to read and write. Another time he answered a letter from his parents, saying that "for a long time I have been distressed and in suspense about you, not knowing what might have happened. I learn to my great joy that you are in good health." I can only imagine the pain that he must have felt at such a lack of correspondence from home, especially when some of his letters went left unanswered Certainly his love for his family did not diminish with the passage of years, as we learn from others of his letters, but how did he endure this isolation from his family and friends whom he left behind in service of the Gospel? Henceforward we shall not have the happiness of seeing one another, but we shall always be united by that tender love which we bear to one another. I find my consolation in the one and only companion who will never leave me, that is, our Divine Saviour in the Holy Eucharist. . . .It is at the foot of the altar that we find the strength necessary in this isolation of ours. Without the Blessed Sacrament a position like mine would be unbearable. But, having Our Lord at my side, I continue always to be happy and content. . . . Jesus in the Blessed Sacrament is the most tender of friends with souls who seek to please Him. His goodness knows how to proportion itself to the smallest of His creatures as to the greatest of them. Be not afraid then in your solitary conversations, to tell Him of your miseries, your fears, your worries, of those who are dear to you, of your projects, and of your hopes. Do so with confidence and with an open heart. He endured the separation from his loved ones back home through his closeness to Jesus Christ present in the Blessed Sacrament. Even with the greater ease and the swiftness of modern communications, and with the ability to return home once or twice a year, this is a lesson I will continually ask him to teach me. Please don't think that I am dreading my new assignment; I am looking forward to it, though I do know that there will be some particular hardships that come with it, the separation from family and friends for a great length of time being perhaps the greatest of them. It is a great happiness to me whenever I have an opportunity of sending news of myself, of reminding you, my dear parents, that on an island in the midst of the great Pacific, you have a son who loves you and a priest who prays for you. I will soon echo these sentiments not from an island in the Pacific, but from an ancient city on the Italian peninsula. In the past, I haven't used Skype very much; now I will have to make frequent use of it. On my desk in my office is a statue of Father Damien that I touched to his relic in the Cathedral of Our Lady of Peace. As I begin considering what I will bring with me to Rome, this statue will certainly be among the first things packed. Each time a priest receives a new ecclesiastical assignment he receives a decree from his Bishop which makes it official. 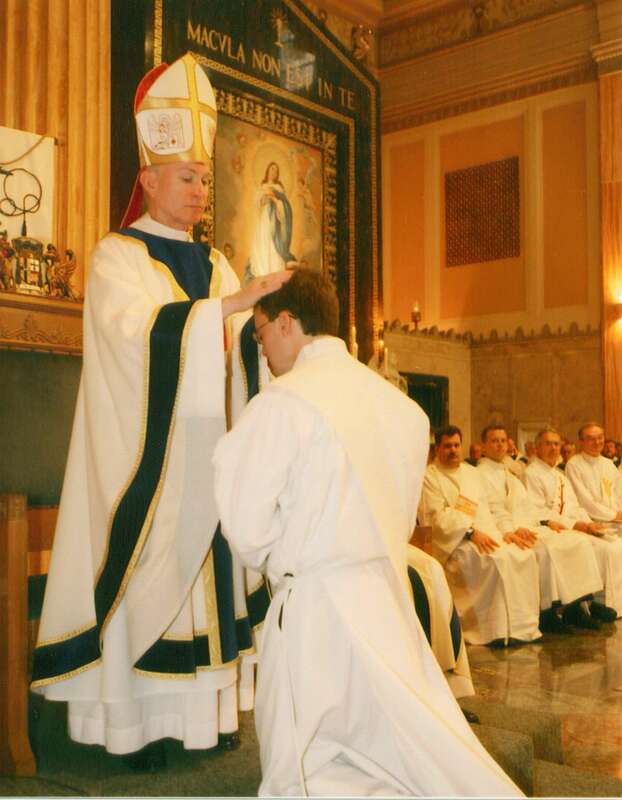 to graduate studies in canon law at the Pontifical Gregorian University, Rome, with residence at the Casa Santa Maria of the Pontifical North American College, Rome, from Priest Secretary and Master of Ceremonies to the Bishop, and Associate Director of the Office for Vocations, effective July 1, 2013. Now it will be filed away with the other Decrees of Appointment I have received. 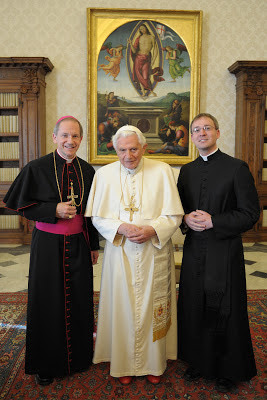 Speaking today to his priests at the annual Jubilee Day, the Most Reverend Thomas John Paprocki, Bishop of Springfield in Illinois, announced a series of new priestly assignments to take effect July 1, 2013, most of which will be announced in the parishes this weekend. Since the 11th of January 2010, I have served as Priest Secretary and Master of Ceremonies to the Bishop and as Associate Director of the Office for Vocations, both positions which I have much enjoyed. However, as His Excellency has seen fit to send me to obtain a Licentiate in Canon Law (J.C.L.) at the Pontifical Gregorian University in Rome, I will soon conclude my present assignments. While in Rome for the next three years, I will reside at the Casa Santa Maria, the house for American priests studying in the Eternal City. Prior to the beginning of this course of studies in October, I will study the Italian language for six weeks at the Academia Lingua Italiana in Assisi, the home of Saints Francis and Clare, beginning July 22nd, and will reside for the length of these studies at the Casa Papa Giovanni. and for the confidence he has placed in me. Bishop Paprocki first mentioned this coming assignment to me, if memory serves, sometime in November and shortly thereafter several friends were asking me to witness their weddings, assist at retreats, or baptize their children. Declining their invitations was not easy, both because I very much wanted to accept them and because I could not tell them why I could not join them for these happy occasions. I am glad now to be able to make the assignment public. As you can well imagine, several tasks now lie before me, not the least of which is packing my earthly possessions and deciding which I will bring with me and which I will leave behind, and where they will stay in my absence, not to mention determining a good “home base” for return visits home. The vast majority of my possessions consists of books, which, thanks be to God, are not terribly difficult to store. My coming move will provide a much looked for opportunity to begin discarding things to which I have paid little attention over the years and really only serve to take up space. It is a curious way how the Lord brings people into your life for a time and then reconnects you years later. During my time in Effingham, I was happy to make the acquaintance of two families in Italy through students in a foreign exchange program at the high school; one of the families lives in Rome (with whom I was able to visit a year ago February) and the other in the north of Italy. I also recently learned that one of my classmates at Mundelein Seminary will also be going to Rome this Fall for advanced studies. When we spent a month in Rome on pilgrimage, he and I often travelled about the city together with a few others; it will be good to so with him again. Bishop Paprocki is also sending one of our seminarians, Michael Friedel, to the Pontifical North American College, the American seminary in Rome. Initially I thought I would be heading to Rome on my own for three years, which felt a bit daunting, but the Lord seems to have taken care of this concern for me. As I look ahead to the coming weeks, I ask your prayers for me. The next three years will be a great and unexpected adventure, one which I welcome. It has not been easy to keep this news quiet these past several months, but in some way I will still have to keep it quiet. Since Saturday afternoon my voice has taken a bit of a vacation – to where I do not know. Today I am able to make a few vocal noises but no words. I expect to be able to speak again on Thursday, or Friday at the latest. So if you happen to call and I do not answer, now you know why. One of the runners, Dominic Rankin, has a post on his blog, Open Wide the Doors for Christ, describing his experience of the run. I am happy to hear that they all completed the race and are doing well. Congratulations, gentlemen; well done! In some ways the act of writing a note of thanks can be learned, and in aspects it is certainly an art at which some people excel and others manage reasonably well. I have really enjoyed the times you have taken us out to eat this year and more importantly, the 2 times you cooked for us. Most of all, thanks for sharing your time, knowledge, opinions and nerdyness with us. I have really come to love hearing your thoughts on various topics. Whether he spelled "nerdyness" properly or not, neither spell check nor I know with certainty, though it seems to me it should be spelled "nerdiness." After two days spent largely on the highway driving through the rain up and down the State of Illinois, and after realizing that I have lost my voice, these words brought a great smile and a good laugh. Nine days from now - on May 10th - we will observe the memorial of my favorite saint, Saint Damien de Vuester. To help us prepare for this great day, someone - I cannot remember on which blog I saw this - has posted a link to a Novena to Father Damien, which begins today (I'm sorry I'm so late with this!). Incidentally, the celebration this year will mark the 140th anniversary of Father Damien's arrival at Kalaupapa.